Palestinian amora of the third generation (3d and 4th cent.). 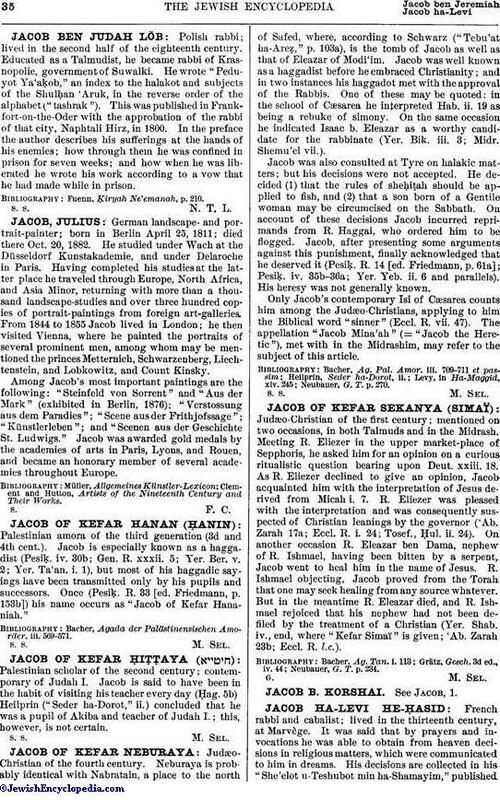 Jacob is especially known as a haggadist (Pesiḳ. iv. 30b; Gen. R. xxxii. 5; Yer. Ber. v. 2; Yer. Ta'an. i. 1), but most of his haggadic sayings have been transmitted only by his pupils and successors. Once (Pesiḳ. R. 33 [ed. Friedmann, p. 153b]) his name occurs as "Jacob of Kefar Hananiah." Bacher, Agada der Palästinensischen Amoräer, iii. 569-571.